Teddies bearing grizzly injuries and pawful illnesses will receive the best treatment possible from Deakin University’s expert medical team this month. 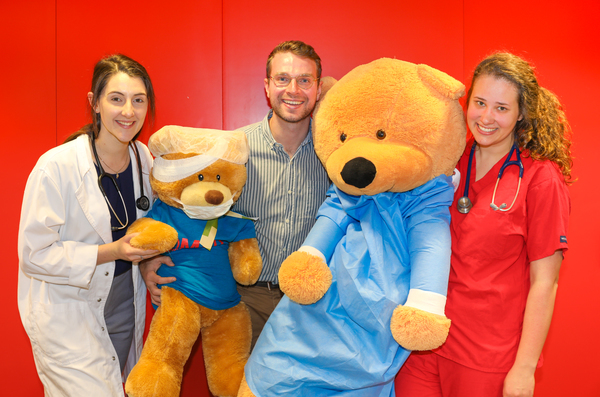 Deakin medical students will hit the paws button on unbearable ailments when Geelong’s Teddy Bear Hospital reopens at the university’s waterfront campus on 22 September. “Children of all ages can bring in their teddies and toys for a check-up,” said chief teddy doctor Rachael Marshall. For a gold coin donation local teddies can get immunisations, X-rays, eye checks and more, with nine stations running from 10am to 3pm. “Every teddy will be triaged when they arrive and given an individual teddy passport to take with them before being whisked away to their first station in the teddy ambulance,” Rachael said. All proceeds would go to University Hospital Geelong’s children ward, Rachael said. The ’hospital’ would help Geelong children see hospitals in a more pawsitive light and take the panda-monium out of visits, Rachael said. Deakin’s health society NOMAD has run a Teddy Bear Hospital program for more than 900 primary school students around Geelong throughout 2018. Teachers described their students as being “excited, engaged and thoroughly immersed” in the two-hour session, Rachael said.